In my Steeden-esque world, the countdown to this season’s opening round was shaping up like any other. As the preseason rolls into February even some of the biggest names pause to assess the tailgating talent. Aussie Test cricket fans might be hurting but plenty have shown the heart to keep the turnstiles spinning. If only Justin Langer could say the same about his fragile top order. 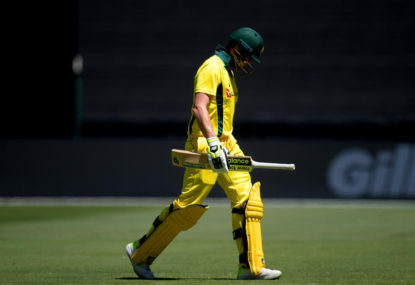 Melbourne Cricket Ground curator Matthew Page was on a hiding to nothing despite his positive spin leading into day one of the Boxing Day Test. David Morrow had lost his lollies; my tiny Corolla speakers throbbed on life support in tune with his booming venom. 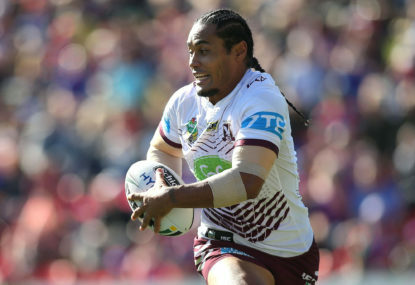 It was 2010 and Steve Matai had just smeared Michael Ennis across the Brookvale turf with a callous high-shot. The frustration in Matt Nable’s voice said it all, “this is rubbish”. As a global collective all red-heads reckon they have more fun. And, if you’re like me, then who’s to argue? I’ll drop anything to watch red-heads for fun. Imagine if rugby league hall of fame nomination was based on attributes aligned to the game’s head-down, bum-up blue-collar building blocks. 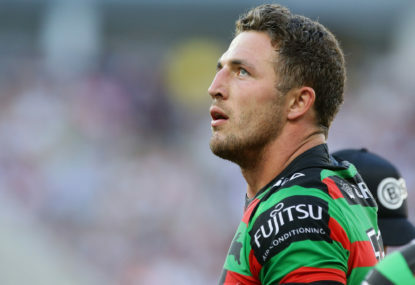 No one wears their heart on their sleeve better than Sam Burgess. And mixed with adrenaline-fuelled mayhem, there’s none more explosive. 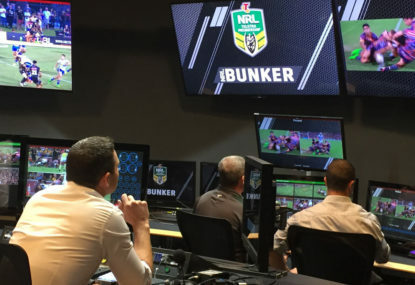 How do you reckon you would have gone at Allianz Stadium last Thursday night trying to convince a rugby league novice the Rabbitohs vs Roosters match they were about to witness is the NRL’s oldest and most bitter rivalry? 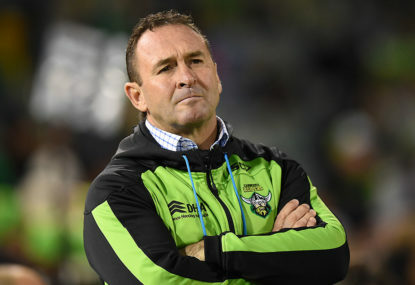 If I supported the Canberra Raiders, I’d want the ballistic Ricky Stuart and his busted plastic chairs over his apologetic alter ego every day of the week. 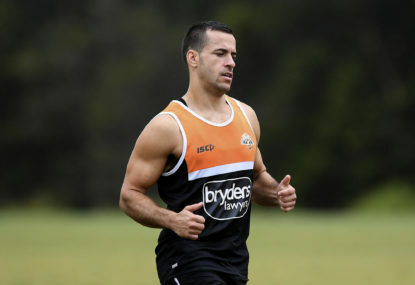 Which NRL walk-up starts are now on the outer? If players knew then what they know now, how many would rip up their contract for an opportunity to play elsewhere? In just over a month you’ll be punching holes in the air as your team cross for their opening try of the season. Chances are though, your precious moment will be shattered by a needless hearing before Judge Bunker. Is the Australian cricket captain switched on and, more importantly, what is his message? Waxheads with years of salty repute reckon the quest for the perfect ride never ends. It’s why they keep suiting up, just like the thirsty and desperate hypnotised by the sign, ‘Free beer tomorrow’. It’s another dog-eat-dog off-season, so who can you trust? Sadly, last Sunday morning’s lazy league read was soured by the news of Malcolm Young’s passing – the unsung AC/DC guitarist whose thumping chords struck with the ferocity of a Trevor Gillmeister shoulder. 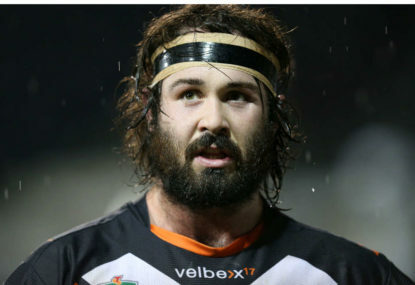 So the World Cup match review committee found Aaron Woods had no case to answer. Well, wax my ’70s mo and turf player safety under the bus. 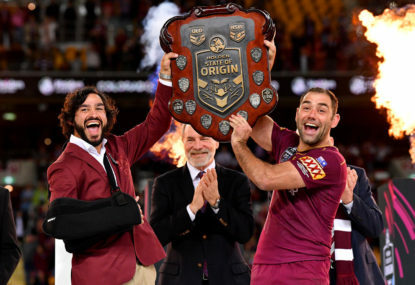 What would you do if State of Origin was on your watch? Seriously, the behemoth cash cow couldn’t fit through the gate even if it wanted to watch itself. 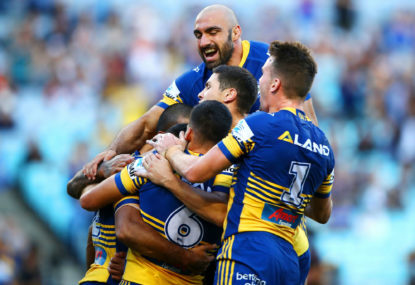 It’s a lopsided NRL draw, so whose ladder position is bogus? 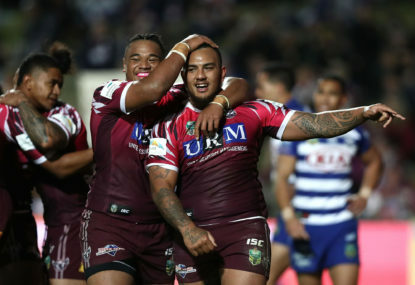 With Round 16 of the NRL kicking off tonight, the similarities between now and 12 months ago offer a useful insight in the race to this year’s finals. Gday Nat. My opinion of McGuire is based on what I’ve seen. Munster was clearly upset and offended, it crossed the line of friendship. I think the judiciary got it right with AFB. Contact with the head isn’t tolerated these days. Sure it was reflex and Pearce ducked, defenders need better judgement even if it means taking the conservative option. McGuire’s gouge was intentional, no reflex, he thought about it and carried out the task. He deliberately attacked the head of an opponent, the most sensitive part. Yet the NRL not only let him off they don’t even bother putting it to a judiciary. It’s not right. Thanks for the update EJ. Pity the Bulldogs in a few weeks when he’s refreshed. All good Papi, no offence taken, it makes for an awkward mouthful. I’d like to think the game has moved on from inter-state bias. Speaking of Gal, I recall he was once found guilty of gouging or was he cleared?? Yeah I really enjoyed Addin’s battle with Klemmer. 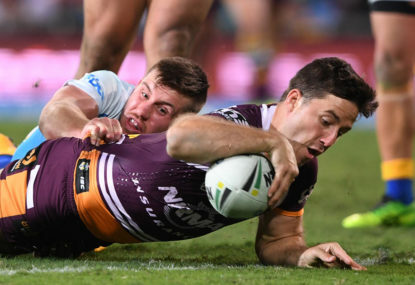 Klemmer deserved all he got after letting Blake cruise under the sticks. 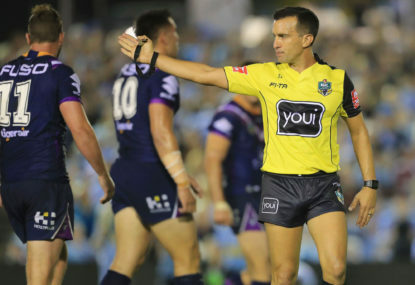 And Klemmer’s salute as Blake made his way off, brilliant – better than a poke in the eye with a blunt finger. 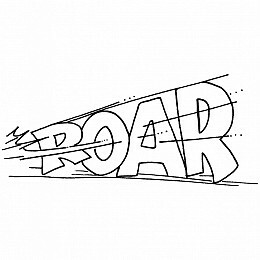 Hey Papi, the freedom to come up with your own headline is one of the best parts of the Roar. Manly are fighting it, db. 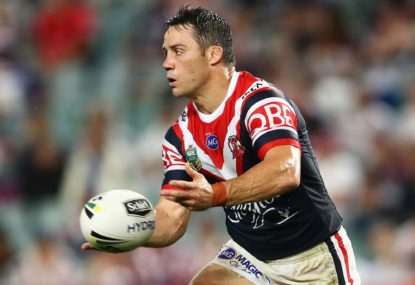 Addin has been named to take on the Dragons. It would be pretty rough but has Munster brought the game into disrepute. 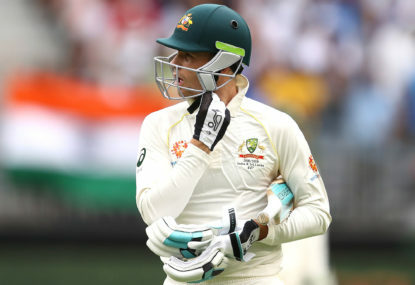 Did he lie on field to protect a mate and come clean post match? That’s pretty much taking the yellow water out of the game. In any event, how long do friendships last when gouging is involved? I don’t follow racing but that was a good read. Be worth posting as an article. Take me through the Sydney Olympics scenario? Scratching my head there. I’ll always watch league but it’s far easier on the eye when my team’s in front. That’s a fair point Paul, all I can say is, it’s not in my top 10 favourite songs. 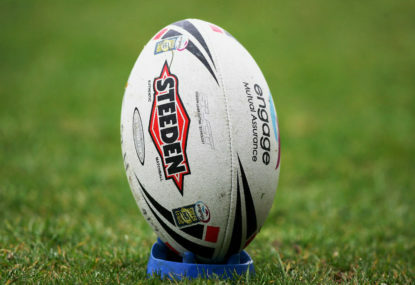 Paul, he was talking in praise of the Indig All Stars mature approach to the topic compared to confrontational alternatives, and reckons the NRL with their high profile couldve assisted in promoting further conversation. 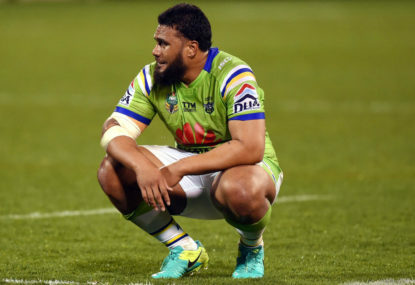 I don’t think the NRL need an opinion either way but they are well placed to open more doors for blokes like Preston Campbell to state their case. Business goals was a good chat. Primarily involving expansion. Does the game try and dominate the east coast or spread further, does it dilute suburbia…one way or another a clear approach is needed. Fair enough Super and i’ll always keep watching regardless of the distractions too. But the game has to be sustainable, so the grass roots case is a good example of where plenty of noise needs to be made. It’s a bleak future for league the less and less kids are involved as time ticks by. To be fair to Anthony in the article though, do you reckon his negativity is justified? 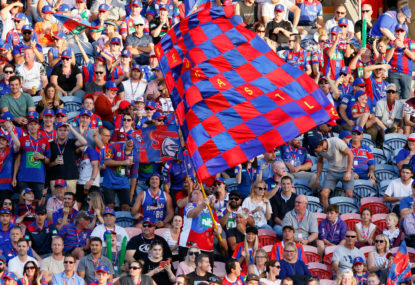 I’m hearing you loud and clear Super, the only bus I caught on the weekend went to Brookie. Ahhhh, go to the top of the class, Wiki…The Rock!! All good Scott. Don’t fall into the trap of listening glowing Manly fans. Mate, I’ll still be hunting positive Manly news until the next round starts. The only other Rueben I can thick of is the ex Rooster prop 15 years back but his was a Ruben and a surname. Good one Scotty, so we’re not even gonna talk about the Turbo in the room. From spoon favourite to rounding out the 8. Yep, a week’s along time in footy, that’s why every day until Thursday should be about the best 8 try romp in NZ since the Scott Donald days. And before I forget Saints, how quick is poached Dragon Rueben Garrick? First person to name the last Rueben to play NRL wins Corey’s signed left boot!! Here’s hoping for more of the same at Leichhardt this arvo kk. Similar drizzly conditions a few years back saw the Tigers roar from the gates before my Eagles knew what hit them. So let the unpredictable madness you touch on swing the Eagles’ way today. Rain, ponchos and sodden Pluto-pups…I cant wait to plant my Grosbys on Mary St.
And Manly scored a try on the 7th tackle in the ‘78 semi finals – we should look at taking the premiership off them too. What’s done is done for me. I’m through with league inequities, especially on the opening day of a new season. Cap…check, flag…check, ticket…check. Let’s GO!!! All good points Tim, and while the shovel is deep, lets question South Sydney’s reinstatement. 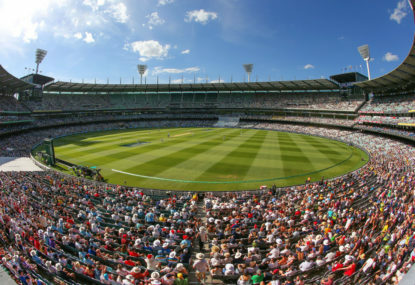 The Gabba will always host an Ashes Test. Day-1 of an Ashes series in Brisbane a must, it’s the only long form game Queenslanders mark on the calendar.